Tracy was born on May 20, 1960, in Eldora, Iowa, to his mother M. Suzette Paul. At the age of 3, Tracy was diagnosed with Prader Willie Syndrome, a rare genetic disorder. At 9 years old, Tracy moved to his first group home, Shepherds, Inc. in Racine, WI. Over the years, he lived in various group homes and in his later years, he settled into his longtime group home, Life Works in Humboldt, where he lived until his sudden illness. In his younger years, Tracy enjoyed attending Camp Sunnyside for many summers and was lucky to be able to participate in the Special Olympics twice. He also enjoyed attending State Fairs, latch hooking and various craft projects. Tracy liked to dance, loved music and enjoyed going bowling. 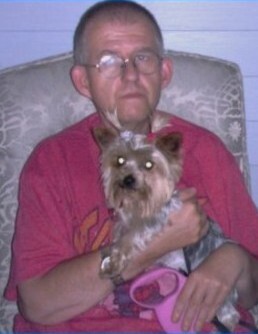 He was an avid animal lover, Yorkie dogs being his favorite. He also enjoyed watching movies, the scarier the better! What brought the most joy to Tracy was food, fellowship and spending time with his family. He loved being together with his family at the holidays, Christmas being his favorite. His family was so happy to say that Tracy lived a long, fulfilling life and that his time on Earth brought them so much joy. They were so grateful to have him here for so many years but have comfort that Tracy and his mom are together again. He is survived by his father Marvin of Eldora; siblings Regina (John) Hoeksema of Bondurant, IA, Eric Paul of Eldora and Monica (Scott) Ridout of Eldora; nephews & nieces Matthew (Nikki) Hoeksema of Ankeny, Cora Paul (Chad) of Eldora, Megan Paul of CA, Emma Paul of Eldora, Becky (Blake) Gustafson of Eldora and Andy Mazurik of Eldora; great nieces and nephew Chloe Hoeksema, Jace Paul, Aspen Stripling and Macy & Paislee Gustafson. Tracy was preceded in death by his mother Suzette; nephew Michael Hoeksema; brother-in-law Tom Mazurik.